Marte from Compagnie M. contacted me a while back and generously asked me if I wanted to try out one of her patterns free of choice. I was very tempted to go with The Swing Skirt pattern but ended up going for a pattern for myself. The Lotta Skirt. A versatile style with some clever drafted pockets. It is a style I love to wear on an every day basis. Oh man, the result is fantastic! Like YES fantastic. It has the perfect amount of width to make it a relaxed comfortable style but at the same time you do not have to worry about going out on a windy day. 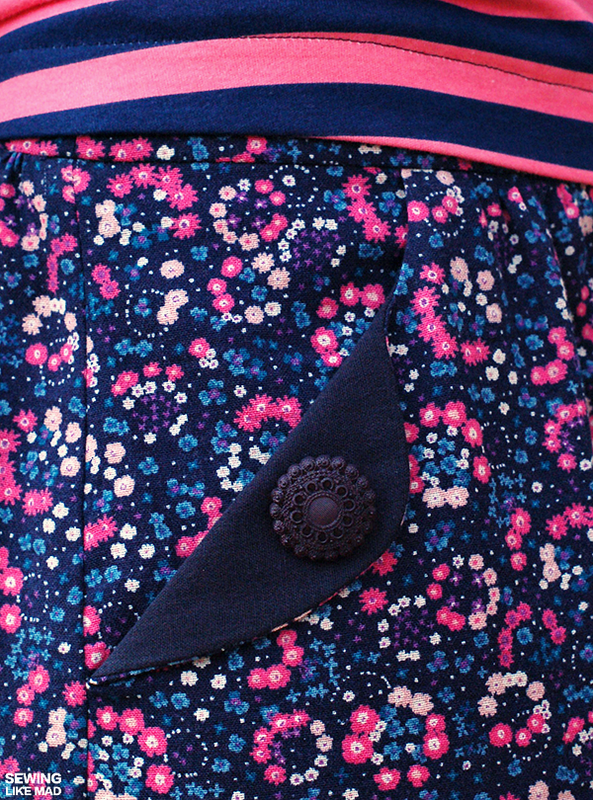 I love the design of the pockets and the chance to add some contrast fabric and pretty buttons on the pocket flaps. Another thing I was really happy about are the lines and angles of the actual pattern. You can see this is made by an architect that knows that those things matters! The result is a great fitting skirt that feels wonderful to wear. I also had some things that I was not so happy with and I don't find it super fun to write about those things. I know that it is someone else's hard work I'm criticizing and who am I to do that?! The first thing I noticed was the creases Marte made with her iron to divide the gatherings on the skirt to the waistband pieces correctly. And beside the fact that a tiny snip in a notch would do that job in a second, I also have to mention that it is really not a good idea to make creases in fabric unless you want them there permanent. If you are unlucky you simply won't be able to iron them away again - especially since you have to do it in the middle of gatherings which you do not want to flatten at all. Then I noticed that the tutorial shows to overlock both skirt and waistband pieces all the way around - also at the top. There is no reason to overlock seams that are going to be hidden inside the waistband. That is both a waste of time and thread plus it adds unnecessary bulk. Especially since the top of the skirt is later gathered and that adds a ton of extra bulk. IF it is for some reason necessary to overlock the seam where the gathered top of the skirt is sewed to the waistband then do it afterwards in one go, gathered skirt seam and waistband seam together. - It needs to be shorter than the skirt which means I afterwards have to measure and cut of more if I don't have a lining pattern. It is a waste of time and fabric. -And the last reason is that when I do not have a lining pattern pieces, I do not have notches for the pleats. The pattern is very correct stating that instead of gathering the lining like the skirt, instead use pleats which is less bulky. But I do not appreciate to be told to do my own calculations so they get placed evenly on each side. This is a product sold for money and in my opinion is it the pattern maker's job to make it complete. The same thing happened for a placement of a notch. I needed a notch where the end of the pocket opening meets the waistband but instead the tutorial tells me to put my waistband up to the skirt and make a mark myself. All this should have been done in the pattern making process and notches should have been added to the pattern. All these things I'm mentioning above might sounds like minor things and they kind of are! Yes, of course the most important thing is the base of the pattern - the actual shape of the pattern pieces are perfect. But like I said before when a sewing pattern is for sale then I think it is in order to expect all the techniques to make sense and all the pattern pieces to be complete - also an optional lining piece. Plus a complete set of notches to ensure a pleasant sewing process. 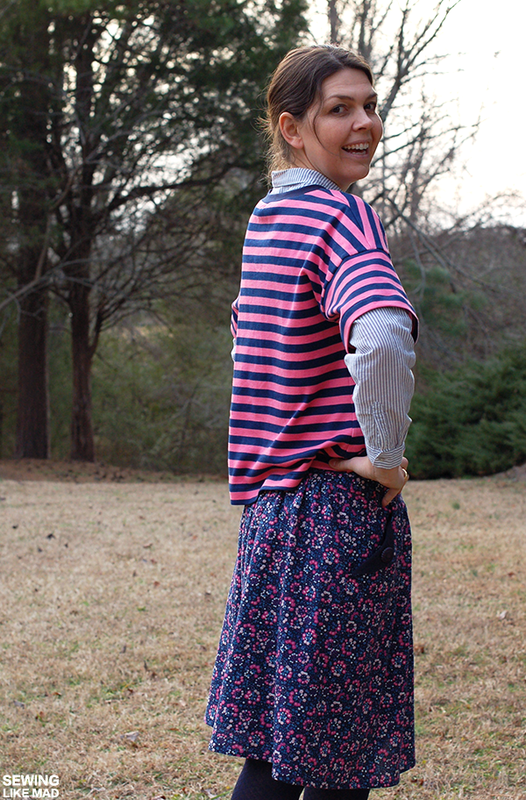 I might be alone about this but I do not only want a perfect result like I certainly got with the Lotta Skirt. I also want a pleasant sewing process where I don't have to get up from my sewing machine unnecessary times to make notches and marks along the way. Now let's return to the lovely things about this pattern because there are lots of that too! The pockets are ingeniously made. Simple yet very cool. They are part of the skirt and then folded over. Smart! I love these old buttons I had left from when I had my apparel company. The fabric is that same flower printed cotton that I used for the yoke for THIS top from Miss Matatabi. The fabric had the perfect drape for this skirt but was ever so slightly see-through so I added a lining. The navy fabric on the pockets is double gauze. I interfaced my pocket flaps. I felt I would get the best result like that. I really love wearing this skirt and I have already made another one (which means I have to go through another photo shoot arghhhhh). I also made this dolman sleeved t-shirt in organic interlock knit from Organic Cotton Plus (psssst it's on sale at the moment). The pattern is from the Japanese sewing book called Stylish Dress Book by Yoshiko Tsukiori. It is actually a pattern for woven fabrics AND a dress but hey....this worked too. Interlock fabric is not very stretchy anyway and I knew this pattern was plenty big and I actually ended up making a size XS (which is not my normal size) and it is still roomy just the way it is suppose to be. I love this outfit and as soon as I don't feel like wearing wool cardigans every day it will be worn all the time. Thank you Marte for your generosity! 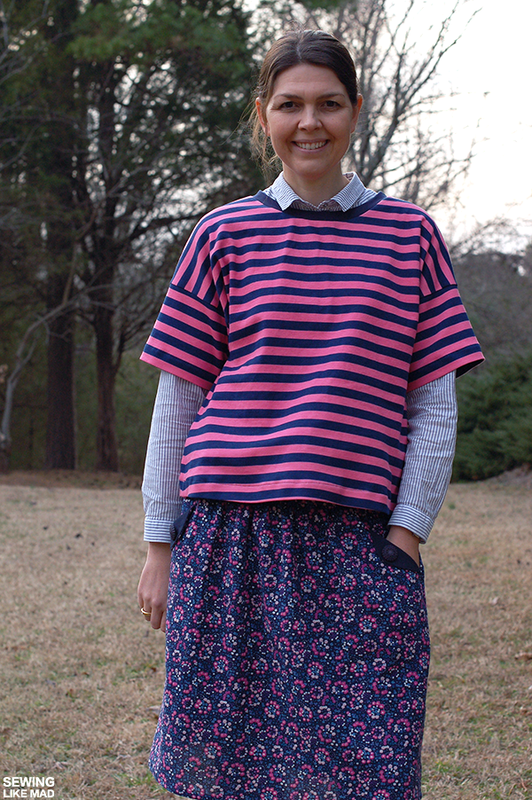 I will be back soon-ish with another Lotta Skirt paired with another top from a Japanese sewing book. Get you Lotta Skirt Pattern HERE. The link is for the pdf-pattern that I used but you can now also buy it as a paper pattern. looks so comfy and i just love that fabric! Love the skirt, the pockets really are a cool feature. And that floral print... Swoon... The woven dress pattern turned into top is amazing. Looove it lots! I love the colour and pattern mix. The details of the skirt are very beautiful but I'm drooling for the top!! The fabric is really nice and those buttons perfect! I love this all so much!!! Awesome fabrics and it looks fantastic on you as always :). Thank you for an honest pattern review! This whole outfit looks fantastic on you, perfect fit too. 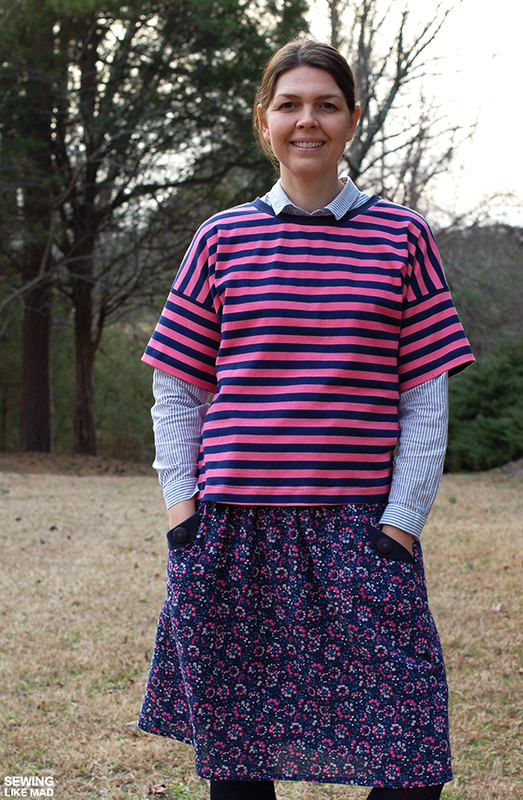 Love the mix of stripes and florals and pink with navy! Love the pocket! The button is so do pretty! You look very pretty and comfy! Oh, and thank you for a honest review. Great constructive criticism. I really think there should be more out there and that the designers should be grateful for them... It doesn't diminish the pattern, only adds to a better making for all those that will be making it in the future. There is a lot of people that look for what other bloggers (who made it already) are saying before they purchase a pattern. Critical reviews like this one don't stop them from buying it if they really love it, they help them to get a better result (like a fitting issue, or picking the size) and that is great. I absolutely LOOOOOVE your honest opinion!! It is nearly impossible to find in most pattern reviews, but SO appreciated! I loved your review...I felt like it was a little sewing/drafting lesson. The skirt has a great fit and flare look, too....I may need this one! Love the outfit Mie. It was very interesting to read a review from someone who has as much knowledge and experience as you. I have both adult and child versions of this pattern and I think I really need to tape them together already! The pockets are so sweet. I love how you shared your constructive criticism. It helps us all become better at our sewing techniques. The top is my favorite part!! Great stripes! Great review Mie. Reminds me why I don't want to make patterns to sell but only for my own use.. Because I know I would miss a zillion important details. But if I am buying one, I want it to be worth it. You look cute! I bet it would look good with the quilted top? Quilted Knit Top with Yoke.